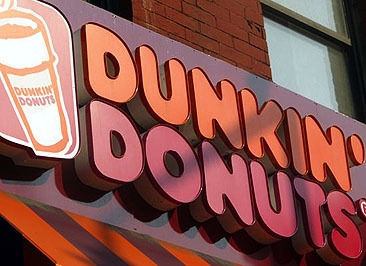 Voter Fraud at Dunkin’ Donuts? Jon Chait has a good post this morning about a Politico story that simply insists on finding some kind of Democratic counterpart to the gruesome and longstanding efforts of Republicans to make it harder for Democratic-leaning groups to vote. In Politico’s defense, their stale attempt at faux evenhandedness only takes up two paragraphs, but the tone of the article throughout suggests that this battle is roughly equivalent on both sides, as if suppressing votes were pretty much the same thing as encouraging votes. You’d think we’d be past that by now, but apparently not. opponent, “a homosexual activist candidate,” bused in homosexuals from other parts of the state who showed up at the polls and claimed residency at an address occupied by a local Dunkin Donuts. Chait cautiously says he “strongly” suspects that “the whole story is an exaggeration at best, and a pure fantasy at worst.” I think I’ll go with pure fantasy myself, even though I have no idea where this story comes from or what urban legend is behind it. This means some enterprising right winger has an opportunity to make me look like a knee-jerk liberal shill who’s never willing to concede even the possibility that conservatives might be acting in good faith. All you have to do is find the wellspring of this story and demonstrate that there’s something to it. Anyone can play. I did a bit of desultory googling, but that’s about all the time I can afford to spend on this right now. But I really am curious, in an academic sort of way. Has anyone ever heard this story before? Where did it come from? Is there even a remote grain of truth anywhere in it?